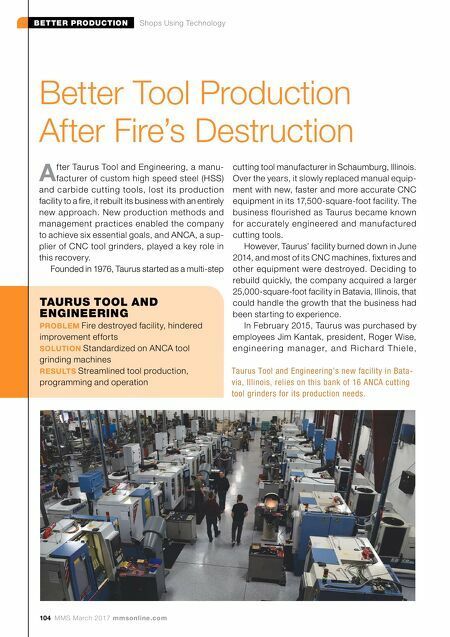 104 MMS March 2017 mmsonline.com BETTER PRODUCTION Shops Using Technology A fter Taurus Tool and Engineering, a manu- facturer of custom high speed steel (HSS) and carbide cutting tools, lost its production facility to a fire, it rebuilt its business with an entirely new approach. New production methods and management practices enabled the company to achieve six essential goals, and ANCA, a sup- plier of CNC tool grinders, played a key role in this recovery. Founded in 1976, Taurus started as a multi-step Better Tool Production After Fire's Destruction cutting tool manufacturer in Schaumburg, Illinois. Over the years, it slowly replaced manual equip- ment with new, faster and more accurate CNC equipment in its 17,500-square-foot facility. 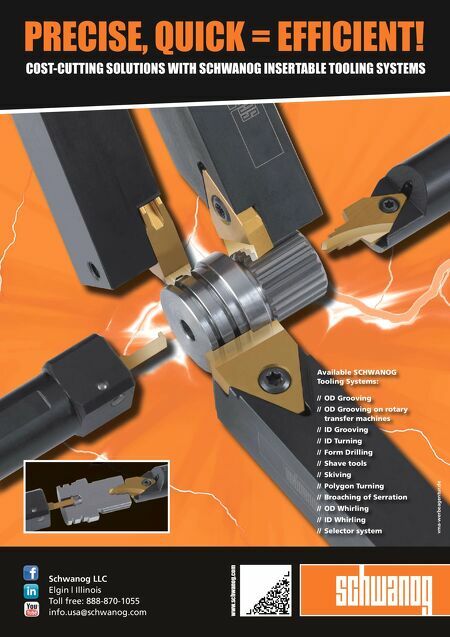 The business flourished as Taurus became known for accurately engineered and manufactured cutting tools. However, Taurus' facility burned down in June 2014, and most of its CNC machines, fixtures and other equipment were destroyed. Deciding to rebuild quickly, the company acquired a larger 25,000-square-foot facility in Batavia, Illinois, that could handle the growth that the business had been starting to experience. In February 2015, Taurus was purchased by employees Jim Kantak, president, Roger Wise, e n g i n e e r i n g m a n a g e r, a n d R i c h a r d T h i e l e, TAURUS TOOL AND ENGINEERING PROBLEM Fire destroyed facility, hindered improvement efforts SOLUTION Standardized on ANCA tool grinding machines RESULTS Streamlined tool production, programming and operation Taurus Tool and Engineering's new facility in Bata- via, Illinois, relies on this bank of 16 ANCA cutting tool grinders for its production needs.